It’s officially 2019. Chances are, you started the New Year with resolutions you’re determined to keep—working out more, eating healthier, etc. 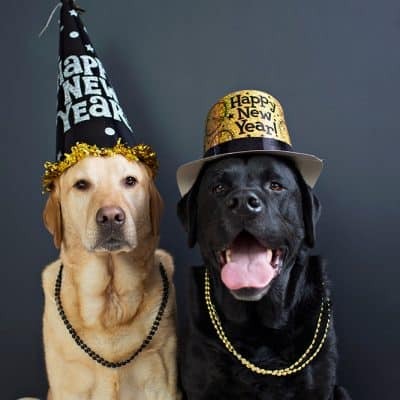 And if you’re a pet parent, you want to ensure your dog starts the New Year on the right track too. 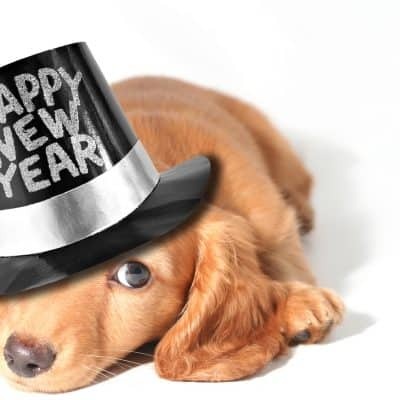 Here are a couple resolutions we thought your fluffy friend would like to abide by. If you have any questions or comments, feel free to contact us here at Ruffger’s. Who said losing weight is just a human goal? Kick off the new year by being the best possible version of yourself and make sure your pooch is healthy and fit to ensure a long life. Maintaining a healthy weight plays a major role in dogs’ overall well-being. However, it’s a common struggle among pet parents—56% of dogs in the U.S. are considered overweight or obese, according to the Association for Pet Obesity Prevention. Stay mindful of the food your pup consumes—both as meals and treats. Choose treats that are made with natural ingredients and don’t contain any artificial preservatives, added sugar, or salt. Once you found a healthy dog treat he enjoys, remember to practice moderation; multiple treats at a time throughout the day can add up quickly! If you need advice on portions or healthier food options, contact your local veterinarian. If one of your dog’s New Year’s resolutions is to lose a few pounds, then exercise is a vital component in a weight-loss plan. Have you ever noticed how good you feel after a great workout? Exercise is proven to release endorphins that make us (and dogs!) feel energetic and happy. You don’t have to hike for miles or walk for days; even just short bursts of active time can help burn off some anxiety and calories. It can be as easy as throwing a tennis ball for your dog to retrieve or a quick walk around the block. After a while, you will both likely crave exercise. Getting ourselves to the doctor every year can be a chore, but paying an annual visit to your veterinarian is one trip you do not want to skip. Aside from ensuring your dog’s overall health is in check, consistent visits to the vet give you the chance to ask about anything that seems to be out-of-the-ordinary. If you’re new to caring for a dog, veterinary visits typically consist of a physical exam to check your dog’s skin, eyes, ears, teeth, and more. Be prepared to answer basic questions about your pup’s eating, sleeping, and potty schedule, too. Make sure to stay on top of all vaccinations your pet needs to ensure your fluffy friend stays healthy and strong. Let’s be real. As humans- we all love spending time with our friends. Dogs are the same way. Make sure to make plenty of puppy play dates with your friends who have dogs. Make sure your dog is socialized and gets along well with other dogs before arranging a play date though. A great first step is to find a good dog park. Aside from allowing your dog to mingle with others, dog parks are also great for owners to get some exercise, socialize with other dog lovers, and maybe even discover a new part of the neighborhood. Always be mindful of the posted rules and be cautious when introducing your dog to others. We all want to grow as individuals, why should dogs be any different? Teaching your fluffy friend a new trick will take healthy doses of patience and persistence, but the reward of seeing him learn and grow is worth it. If you’re starting with the basics of sit, stay, and come, or exploring some more advanced training drills like standing on command, keep your sessions short but frequent. Think of training in three steps: incentivize, command, and reward. 1) Incentivize – Show your dog a treat or toy to catch his attention. 2) Command – Clearly state what you want him to do, staying consistent with the word or phrase you use each time. 3) Reward – Dogs respond to positive reinforcement, so rewarding him with a treat for a job well done will encourage more good behavior in the future! Work toward these goals at any time of the year for a healthier and more fulfilling life with your pup.